Oh World! I Cannot Hold Thee Close Enough! Waiting at the entrance for the right time to explore new worlds. This was done so very much at the beginning of my explorative journey into things mystical and my deeper self. At the time I was only willing to stick my big toe in so I named it “Patience.” Now I’m in the midst of it – in the birth canal no longer. 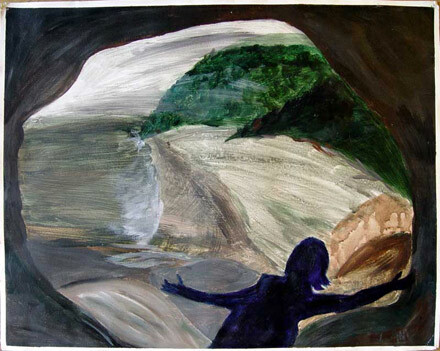 Journal 4/22/98: Me standing in a cave looking out at the landscape. The answers are there for me in the tides, the beach, the trees and the mountains. The patience part is about waiting, doing, being while things take shape and grow in me. The figure is actually my shadow – though it can be read either way. 6/25/95: This was done after our honeymoon to Otter Crest. Tom and I, finally married after 23 years together, walked on the beach there at low tide down to the Devil’s Punch Bowl. Looking out from inside felt like looking out of the womb – the cave-like rock above, around and beneath me. On the way home we stopped at Salishan Lodge to pay respects to Fred Kline’s paintings there. The one I like was up in the bar. This time there was an obnoxious couple in front of it watching a ball game. “Drab painting,” muttered the man, “Drab colors, drab Oregon.” So when I got a chance I painted another “drab” painting – not consciously to refute him and not consciously like Fred’s either, but the influence is definitely there.